Full Time Rving sounds fun, but there are lots of things to consider before you get started with RV living. You'll have to consider what kind of an RV will be right for you for the kind of RV lifestyle you want to create. Will you travel a lot, or be mostly in one place? How do you plan to finance your RV and your new lifestyle? Should you rent an RV and try Rving before you make a purchase decision? What kind of insurance will you need and how will you know if you have the right coverage? What you should know about towing before purchasing a trailer and tow vehicle. Consider all of your options and get off to a great start in this simple and fun lifestyle. These articles will help you get started towards your dream of becoming a full-time Rver. 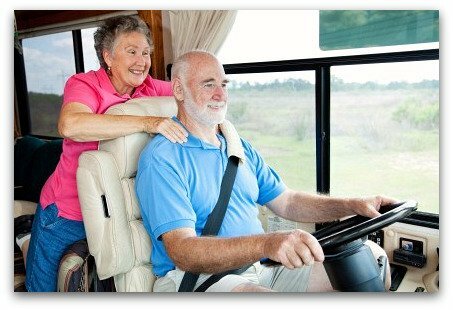 Cutting RV costs for full-timers can actually lead to a more fulfilling experience. Get FREE camping, National Park Passes, and Discount Memberships. Once you are a full time RV-er, there is just no such thing as lost. 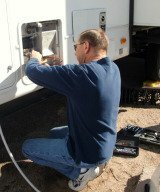 Today there are lots of opportunities for RV Jobs that earn income while traveling fulltime in an RV. Go Rving! Making an RV camping checklist, whether its your first time or youre going on the road as a full-time RVer, is something you should always do. RV roadside assistance is different from typical automobile towing as RVs require larger tow trucks, cannot go on a flatbed, and sometimes require two trucks. It is important when traveling to carry vehicle emergency kits, which is different from a first aid kit, as they vary for cars, RV's and commercial vehicles. Quite helpful to the RVer, RV dump stations receive dirty and used waste water from your holding tank or other device that acts in a similar manner. Motorhome towing is important for RV owners to think about, whether it pertains to safety measures when towing a vehicle or what to do if you need a tow.